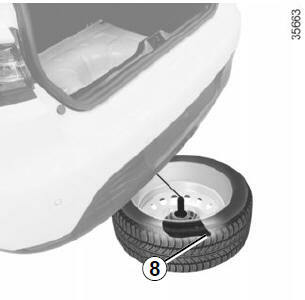 A wheel size larger than 15” cannot be installed under the vehicle. To carry out this operation, the cable must be unwound. recover the cable from underneath the vehicle. You may refit the wheel. 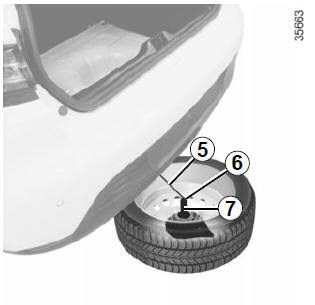 After changing a wheel, position the replaced wheel on support 7, with the valve facing the ground. Clip cable 5 in its housing 6, then push the wheel under the boot. Ensure that tab 8 is positioned towards the rear of the vehicle. Position yourself behind the vehicle and pull handle 4 to raise the wheel until it is anchored under the vehicle. Make sure that no-one has their fingers close to the cable when you move the handle: risk of injury.